Dry Bak Kut Teh has been a craze for a few years now in Malaysia. 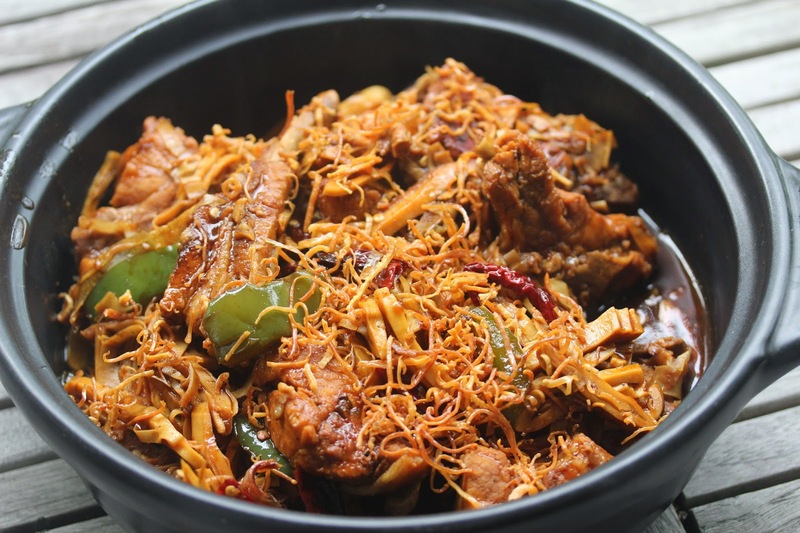 Even before I encountered it in restaurants, I have always imagined that a dry version of BKT should work nicely, a sort of braised pork ribs in herbal sauce. Of late, it has been a craze in local BKT joints here. With some tips from my friend (Jabez) who owns the Soon Huat Bak Kut Teh, I did try making it in Toronto but I did not quite have the right ingredients. When I got back here, I gave it a go and I was satisfied with it. If you know how to cook Bak Kut Teh (I have a recipe here), this should be easy. The idea is to add some BKT soup and braise the ribs till the sauce is dry, not unlike the braising method for pork ribs (I have a recipe for that here). Following my friend's recipe, I added the cuttlefish strips as it indeed elevates the dish, especially if it's used after they are fried. I made some variations from those sold in restaurants here. This is the advantage when you do home-cooking. You can choose to vary the ingredients. I added fresh bamboo shreds which goes well with the pork ribs and they are suited for braising. I also use green pepper instead of lady fingers for the simple reason that I will only use them if I can get them young and crunchy - i.e. the tip breaks off easily when pressed with the thumb - not that I have an issue with old and wrinkled lady fingers. :) Alternatively, you can also add spring onions, doing so only at the final stage of cooking. Pork ribs: I prefer those that have a thinner layer of meat wrapping around the bones instead of the king spare ribs which have chunks of meat. It cost about $15 at the wet markets. Cut them into about 1 inch in size. Note that the larger the ribs are, the longer the cooking time. The BKT herbs - my favourite herbs is the A1 brand. Choose a brand which comes with both herbs and powder. For a kilo of pork, you need only 20% of the packet as you are doing a dry version. I boil the herbs in a litre of water for half an hour and use a portion of it and reserve the rest for another lot. As I use a pressure cooker to do this, I only need to do so for 10 minutes and there is less water evaporation. 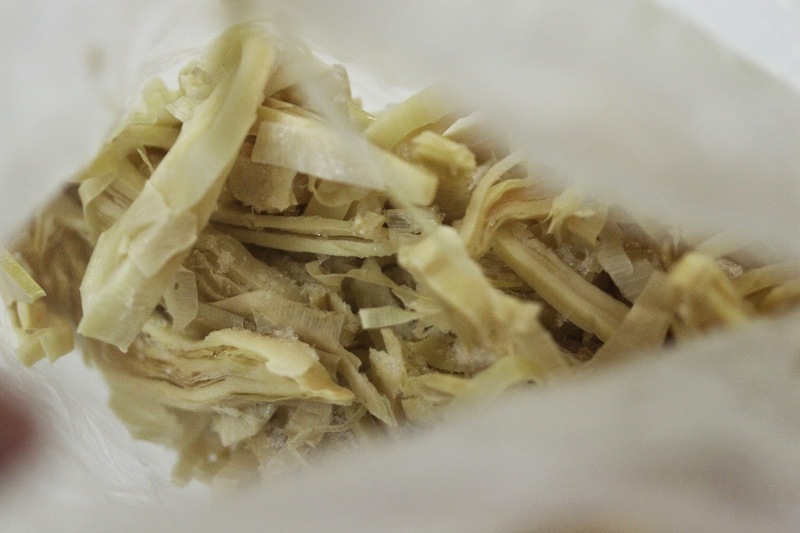 Fresh bamboo shreds: I buy mine from a stall in Ghim Moh market which sells fish balls, mee etc. Ask around. 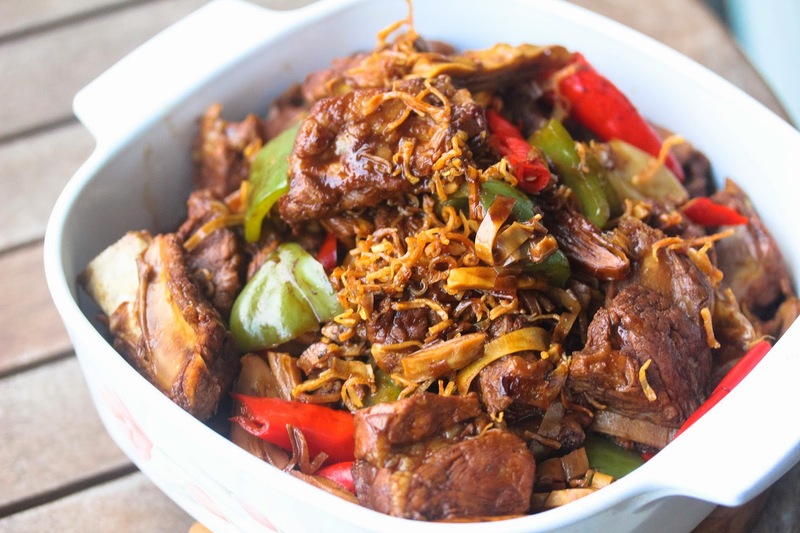 When properly braised, the bamboo shreds are crunchy. Though flavour less on it's own, it absorbs flavours very well. Garlic cloves - just give them a light smash. You get the cloves from bulbs and so if you have a large bulb, just break up the bulb and use the cloves. Cuttlefish strips - deep fry them for 2 minutes in medium fire and set aside. 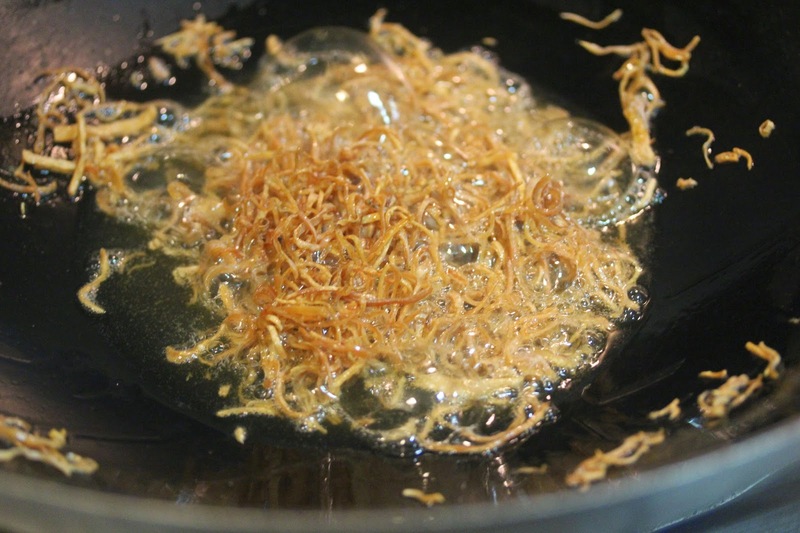 The same oil can be used for cooking later but note that it will be salty. Dried chillies- soak them first. In a wok, pot or claypot, add some oil, dried chillies, garlic and brown sugar. Then add the ribs, bamboo shreds and sauces. Stir. Add the BKT soup and braise gently for 40 minutes or till the ribs are tender enough and most of the sauce has dried up. Midway, add the green pepper or lady fingers and wine. The sauce can be thickened by using corn starch. Serve it garnished with the fried cuttlefish strips and some coriander leaves. On this occasion I added fresh red chillies.